VGPC recently started a twitter account http://twitter.com/vgpc. We will be posting updates with news, article links, and anything else related to video game collecting and video game prices. Our latest twitter is about the Myriad 6-in-1 up for sale on ebay. It is one of the rarest games ever and has been ranked as one of the holy grails of game collecting. Feel free to follow me on twitter and let me know your twitter name too so I can follow some of our readers too. 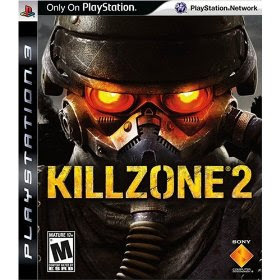 The big release of the week is Killzone 2 for Playstation 3. The game looks really good from the videos I've seen and it will probably sell really well too. This is the 3rd week in a row without a single PS2 game released. The system is definitely on the way out for the average gamer which means there might be a few games collectors might be interested in (if the PS2 behaves like other systems). Games released in the last year of the console's life have a much better chance of becoming rare and expensive. Over the weekend a flood of rare NES Panesian games came up for auction on ebay. Two Peek-A-Boo Pokers, a Bubble Bath Babes, and three Hot Slots. You will usually only see one or two of these every couple of months so six of them available during one weekend is very strange. One seller is selling his Peek-A-Boo Poker, Bubble Bath Babes, and Hot Slots. He must need to raise some cash and it should work because all of these games sells for more than $500 on average. A few of these even include the boxes making them even more rare. Mario Kart Wii - When Will The Shortage End? Yesterday I went into Best Buy to try and buy Mario Kart Wii. Five or more of my Wii friends have the game and I wanted to play online with them. Unfortunately the game was sold out. They checked all the Best Buy's in the Denver area and not one had the game in stock. 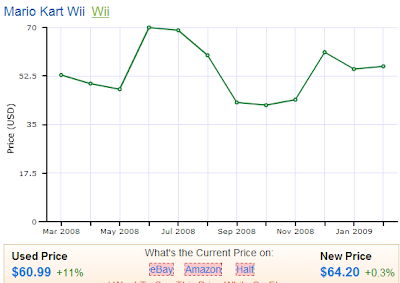 Mario Kart Wii continues to sell for more than retail price in the resale market too. I don't understand how Mario Kart Wii can still be in such short supply nearly a year after release. According to NPD, Mario Kart sold 292,000 games in January 2009. That makes it the 3rd best selling game of the month, but Wii Fit, which comes with a much more complicated peripheral, sold 777,000 units. Nintendo should be able to make a lot more than 292,000 Mario Kart's in one month if they can make nearly 800,000 Wii Fit's. Finally a week in 2009 with more than 4-5 games coming out and a couple good ones. House of the Dead Overkill comes out for the Wii this week which I am looking forward to. For those old school game lovers, the 360 and PS3 are both getting the "Ultimate Genesis Collection". I don't think this will be coming out on the Wii though because Sega sells many of these games for $8 each on the virtual console. The "What a Crazy Concept for a Game" award this week goes to "Onechanbara Bikini" for 360 and Wii. You play as bikini clad samurai women who use swords to kill their enemies. Apparently the game has a decent following in Japan but I have my doubts it will do very well here in the states.